This extension lets you search for posts where a user is quoted. 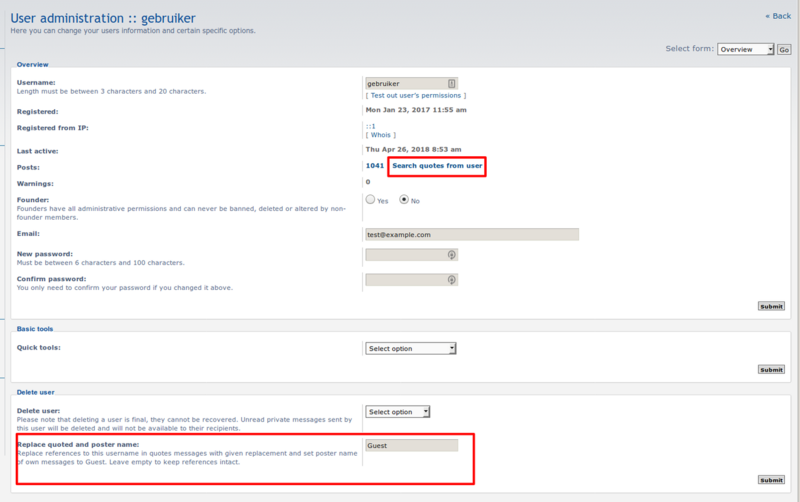 Adds quick link under the Profile in the header navbar and a search link in ACP -> manage users. Last edited by Ger on Mon Oct 15, 2018 9:11 am, edited 5 times in total. This extension now also has the ability to anonymize users in quotes by other users. This is useful for GDPR complaince regarding the "Right to be forgotten". If I put in the field "deleted user", instead of guest, then the poster name of own massages and the name in the quotes in "deleted user" renamed? Or is the poster name of own massages always rewritten as "guest"? I didn't quite understand that. The poster name of own massages is always rewritten to guest. If you change that from guest to something else, that will be changed only in the quotes. There proved to be a minor glitch in the search results when posts have been deleted resulting in search results pages with just a handful of posts. To cope with this I've added a cron task that cleans up the quote index every 6 hours. Is it enough to create the index once? Yep, you have to create an index once and then each new post is added to the index automatically. I have just installed the update 1.0.1. I can not create an index anymore. I have installed the old version, works again without problems. It seemed I freed a DB result a bit too early. Is fixed now. First suspected that it could be my de language file.